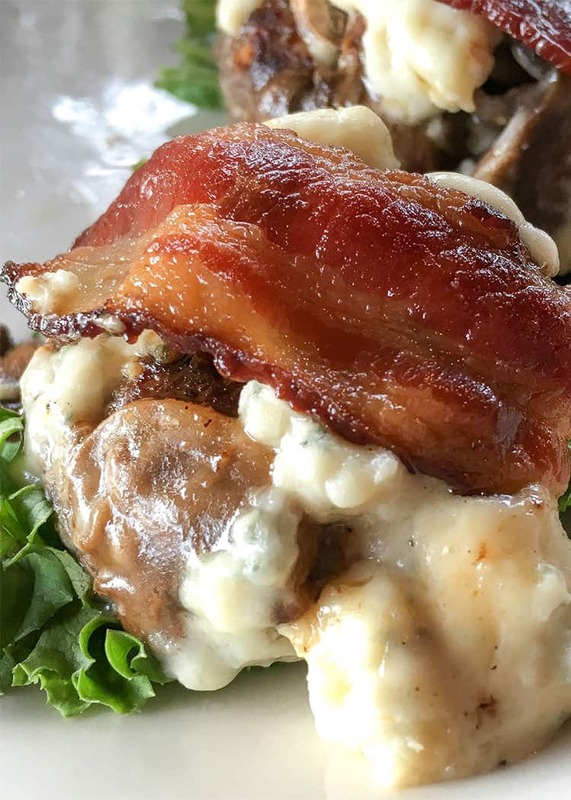 Keto Hamburgers (Sliders) with Bacon, Blue Cheese, and Mushrooms are an amazing addition to your keto meal plan. They’re so good, in fact, you won’t even miss the bun! I would go so far as to say these keto hamburgers are almost better than a traditional burger. There is nothing to separate your taste buds from the unbelievably good flavor of ground beef, bacon, and cheese. It’s just you and the good stuff… no bun necessary! They come together in a few simple steps and you can have them on the table in under an hour. A quick and easy keto meal! An easy (and suggested) side for Keto Hamburgers (Sliders) with Bacon, Blue Cheese, and Mushrooms is a 12-oz package of steamed frozen broccoli. If you pick up one of those kinds that you can steam in the bag, just throw it in the microwave at the same time as Step #6 of this recipe. Broccoli is high in fiber, which means it’s low in net carbs. You can still enjoy these burgers! In fact, you can add 1 tablespoon Worcestershire sauce to the beef mixture before cooking it to give the burgers even more flavor. If you’re not on the keto diet (or another low carb diet), don’t let the idea of a recipe being keto turn you away. Keto-friendly recipes are tasty even if you don’t follow a keto diet! WHAT KIND OF GROUND BEEF SHOULD I USE IN KETO HAMBURGERS? HOW MANY SERVINGS ARE IN KETO HAMBURGERS? There are four servings in this keto recipe. That means you’ll get two filling sliders per serving! HOW MANY CARBS ARE IN KETO HAMBURGERS? These keto hamburgers are practically carb-free! Each serving contains only 2.9 grams of carbs… 0.4 grams of which is fiber. That gives each serving of keto hamburgers a net carb count of only 2.5 grams. More Easy Keto Recipes for You to Enjoy! If you’re looking for more easy (and delicious) keto recipes to enjoy on the keto diet, I’ve got you covered. Check out these tasty keto recipes! Keto Salad – Wedge Salad with Homemade Blue Cheese Dressing (2g net carbs/serving): This keto salad makes a great side dish choice. Easy Keto Soup with Sausage, Peppers, and Spinach (1.9g net carbs/serving): This warming soup is full of flavor and perfect for the keto diet. 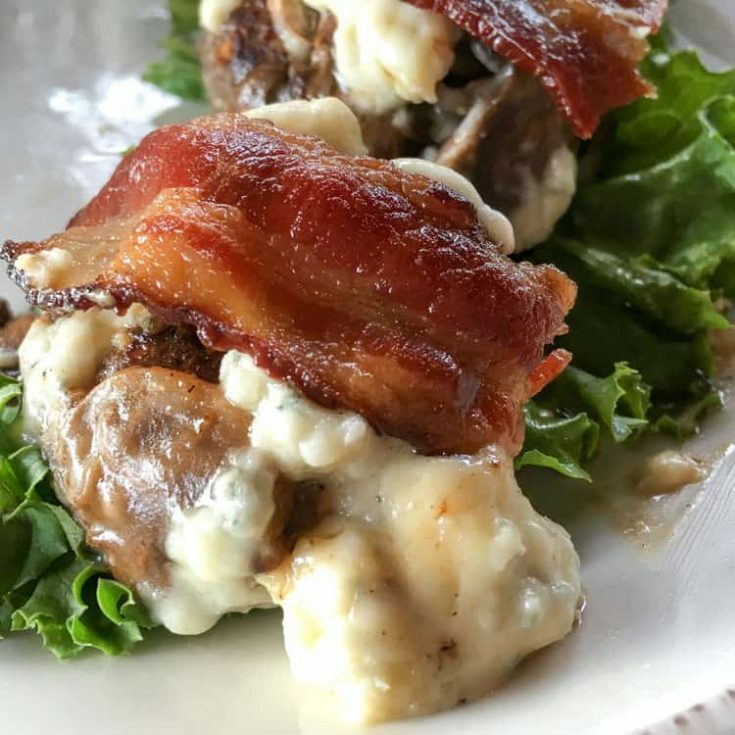 These bun-less bacon, blue cheese, and mushroom sliders are perfect for the keto diet! Place the top oven rack on the second highest setting, then preheat the oven broiler to high. To a medium bowl, add ground beef, mustard, garlic, and onion. Season with salt and pepper to taste. Mix with a fork (or your fingers) until ingredients are thoroughly combined. Divide the mixture into 8 equal portions and shape into small patties. Put the patties on a plate, and then gently press the center of each patty with your thumb. (This will keep them from puffing up while they cook.) Set patties aside. In a large, oven-safe skillet, heat olive oil over medium-high heat. Add mushrooms. Cook, stirring occasionally, until the mushrooms have browned (about 5-6 minutes). Remove from heat, transfer them to a small bowl, and then set aside. Add the remaining tablespoon of olive oil to the pan. Swirl to coat the bottom of the pan with the oil. Add patties to the skillet and cook until brown on each side (about 2-3 minutes per side). Remove patties from heat. Top each one with sautéed mushrooms and blue cheese. Place them in a skillet under the broiler for 2-3 minutes, or until the cheese begins to melt. Remove skillet from onion. Top each patty with a piece of bacon. Serve immediately on a bed of lettuce.